AQUASCAPE | Aquascape Custom crafted pools, spas, fountains and water features has earned Aquascape Pools a reputation as the premier builder in the Greater San Francisco Bay Area. We approach each project with a broad exploration of all aspects of each unique site. We’ve established a renowned reputation for our innovative approach to design and construction. AQUASCAPE CONSULTING | Providing consulting to architects, design professionals and contractors – Design review, site review, building permit services, project supervision, mechanical design and drawings. Our open collaboration with architects and design professionals, innovative solutions for contractors, and dedication to providing the best functionality for any pool design guarantees that the construction of the pool will be smooth and successful. 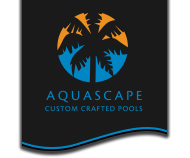 AQUASCAPE POOL SERVICE | Providing professional, friendly weekly pool service, renovations and repairs for all of your pool, spa, water feature and fountain needs. Our sharp attention to every detail, proactive maintenance to prevent problems, and immediate response to our customers’ unique and challenging needs enables us to keep the pool looking like it did the day it was finished.